Has your back ever been sore after a long day? Do you notice yourself slouching sometimes in the car or at your chair? You might be suffering from poor posture, but have no fear, because yoga can help with that. Living in the modern world, we are sitting much of the day. And unfortunately, it is causing us to have back problems. Sitting can cue our abdomen to relax and collapse, which pulls on our low back muscles and shoulders. A helpful tip is to be mindful of how you are sitting. Engage your core and lengthen your spine. This may make a huge difference in how your back feels! For example, a balanced class with 6 postures might incorporate forward fold, cobra, seated twist, and half moon. 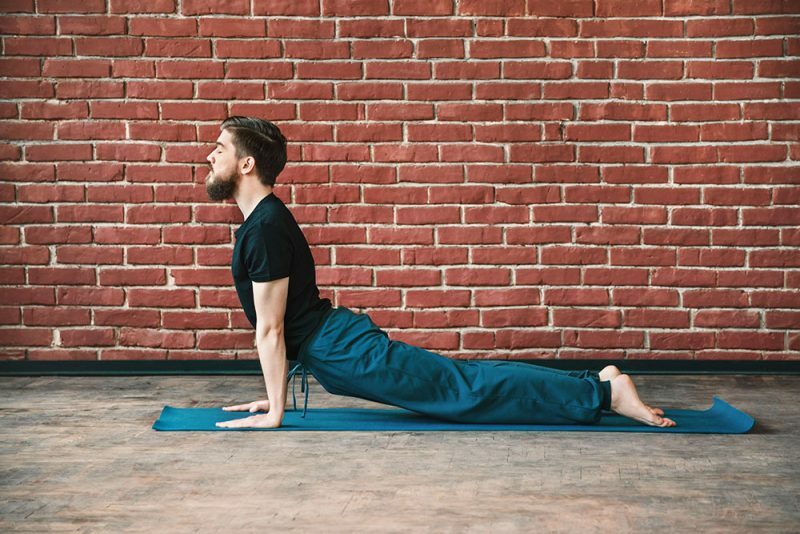 Here are 12 yoga poses to improve your posture and strengthen your back muscles once and for all. You may even find yourself feeling a little taller than before! Mountain pose is the foundation of all standing yoga postures. It stabilizes your joints and naturally brings the entire spine into alignment. While it may seem simple, there are some important cues you need to remember. Starting with the feet hip distance apart, ground the four corners of both feet into your mat. Notice the balls, heels and soles pressing against the earth. Tighten your core and tuck your tailbone in to support the low back. Keep the arms down by your sides, and roll your shoulders back down away from your ears. Tilt your chin slightly upwards and reach the top of your head to the sky. You’re now in tadasana. Ta-da (sana)! This posture can be held for 10 breaths or 1 minute to center the body in a standing position. This posture will center your mind and your spine. Tree pose requires balance and intense focus. Begin with your feet hip distance apart in tadasana. Gaze at a point on the wall in front of you or on the floor several feet away so that your head remains in a neutral position. Shift your weight onto one foot and lengthen that leg without locking your knee. Take the other foot and place it on the inner thigh. If this does not work for you, place the foot on the inside of your ankle or calf. Slightly tilt the pelvis forward to lengthen the spine and strengthen the low back and abdomen. Bring the hands together in prayer position and hold vrksasana for 5 breaths. Repeat this with the other leg. This deep back extension can relieve your back discomfort while improving your posture. Cobra also stretches the muscles in the front of the torso all the way up to the crown. To begin, lay on your belly with your legs extended behind you. Your feet should be as close together as possible. Place your hands flat on the mat underneath the shoulders. Draw your elbows in towards the midline of the body. Press your pelvic triangle against the mat and tuck your tailbone inward. Lift your upper torso off of the mat and resist using your hands to push you up. Extend your crown up to the ceiling and continue to lift your belly off the floor, now using the hands to extend your spine. Roll your shoulders down and back to create space for the chest to open and keep the back arched as much as possible. Cobra posture is best done in between two postures that flex the back muscles, such as downward dog or forward fold. This quintessential yoga pose is a super stretch for the hamstrings and calf muscles. By releasing tension in the legs, your back muscles also relax, creating better overall posture. Adho mukha svanasana also strengthens the shoulders and upper back. Begin in a table top position with your hands underneath the shoulders and your knees hip distance apart. Tuck the toes underneath and place them on the mat. Press the hands firmly against the earth and engage the arms. Keep your knees bent, lift them off of the mat, and raise your hips high to the sky. Rotate the shoulders away from the spine and press your chest towards the thighs. Straighten the legs as much as you can to keep the spine elongated throughout. Hold this for 30 seconds and alternate pushing each heel to the mat for a deeper stretch in the back of the legs. This is an excellent preparatory posture before any warrior pose or balancing exercise. Utkatasana strengthens the spine and activates all muscles in the lower body simultaneously. You will certainly feel the heat in your quadriceps and shoulders if you hold this posture for 5 to 10 breaths. Begin in tadasana and lift your arms in front of you to shoulder height, palms faced down. Keeping your belly and tailbone tucked, bend your knees and lower your hips. The back should be slightly arched with the weight towards the back of the heels for proper balance. Continue to lower your hips and lift your chest to achieve complete spinal extension. Ensure that your knees are directly in line with your hips the whole time. The further you take this posture, the more you will align and lengthen the entire spine. Chair is best held for 30 seconds at a time. This challenging pose definitely requires a strong core and back to sustain balance. It also works the front of the hips, so make sure to stretch your hip flexors beforehand. To begin, sit tall with your knees bent and your feet on the earth. Place the hands underneath the thighs to keep your spine straight. Pull the belly into the spine and sit back on your sitz-bones. Extend your back up through the crown and lift the feet off the floor. Elongate the legs as much as you can and straighten your arms out in front of you. You should be in a V position. Continue to lift the legs higher and keep the back slightly arched. Hold boat for 5-10 breaths and stay afloat! This one-legged lunge strengthens, stretches and lengthens all at once. In the lower body, the quads and glutes work the most. In the upper body, the shoulders and upper back muscles are activated throughout. To start, stand tall in mountain pose at the top of your mat. Step one foot back behind you in a lunge position and place your hands on the hips. Your feet should be hip width apart while the legs are staggered. Straighten the back leg and press your heel down as much as you can. Bend the front knee directly over the ankle and point the hips forward. Tuck the tailbone and inhale the arms up to the ceiling. Lengthen through the waist and lift the crown up. Repeat with the other leg. Hold Warrior I for 5 – 10 breaths, or 30 seconds, on each side for excellent posture. If you practice flow yoga or vinyasa, warrior 1 is a great posture to take from downward dog after a sun salutation. While many postures flex or extend the spine, ardha chandrasana works the muscles laterally. This pose increases spinal flexibility and alignment. It is a strengthening asana for both the upper and lower body. Stand tall in Tadasana. Inhale the arms up and clasp the hands together in temple mudra. Press down through the bottom of the feet and gently tuck the pelvis forward. Shift the hips over to the right and bend your torso to the left, keeping the ribs and abdomen lengthened. Lift out of the waist, extend the fingers and press the feet firmly into the mat for 5 complete breaths. Repeat half moon on the other side for a great lateral spine workout. Uttanasana is a deep stretch for all the muscles in back of the body. It releases tension in the hamstrings and upper back the most. Begin in mountain pose with the feet hip distance apart. Inhale the arms up to the ceiling. Exhale as you bend forward from the waist and fold the torso over the legs. Bring the hands down to the floor or to the calves. Straighten the legs as much as you can for a deep stretch in the hamstrings. Lift the tailbone high and relax the torso as you exhale to stretch the back muscles. To release tension in the neck, nod the head up and down then shake it back and forth. This posture is best held for 30 seconds to 1 minute. Forward fold is a perfect cool down posture after a challenging warrior sequence or deep back bend. Bridge is one of the best yoga postures for a more flexible spine. It strengthens all the muscles in the back of the body from the neck down to the calves. By expanding the chest upward, you also stimulate major organs and chakra points. To start, lie on your back with your feet on the mat. Bring the feet hip distance apart and your arms down by the sides. Press both the hands and feet firmly into the floor. Tuck your tailbone and lift your pelvis off the mat, keeping your knees in line with the hips. Lift the body as high as you can and hold for 5 – 10 breaths or 30 seconds to 1 minute. Keep the core, legs and shoulders activated. Since this is a back extension you may bring your knees into the chest and rock from side to side for a counter movement. This challenging balance pose conditions the spine, legs and abdomen. It helps with focus, alignment, and can even alleviate anxiety. Begin in warrior I on one side. Deeply bend the front knee and push off the mat, lifting the back leg off the floor. To maintain balance, tuck the belly in and keep the front knee slightly bent. Continue to bend from the waist until your torso and back leg are parallel to the floor. Straighten the standing leg and make sure your hips are level to the ground. Keep the arms extended by the ears and push the back heel away from you. Hold virabhadrasana III for 5 breaths, or 15 seconds, and repeat on the other side. It is best to do some balancing warm up exercises for both the legs and feet beforehand. This seated asana releases tension in the intercostal muscles of the ribs and the back. It can be a pain relieving twist which can improve overall posture. Begin with the body in dandasana, sitting on the sitz-bones with your legs extended in front of you. Bend one knee and place the foot on the outside of the other thigh. Bend the arm that is on the same side as the straight leg, twist your body towards the bent knee and hook your elbow on the outside of that knee. Place the other hand behind you and continue to twist for 5- 10 breaths. Repeat matsyendrasana on the other side for a full body release. This posture is best performed as a cool down or warm up exercise to open up any tense areas. You can combine any and all of these postures into an entire yoga sequence, or pick and choose the ones you like best. It is always best to incorporate all 6 movements of the spine and to counter each movement with its opposite action. Make posture your goal and try these asanas today!